Since the screen uses most of the space, the guitar doesn't have its usual controller. Instead, Cyberpyrot—who did the mod—added a magnetic switch under the body so he could use a magnetic pick to play the guitar. Cyberpyrot told that "yeah, it plays better but unfortunately I don't." The touchscreen itself mirrors the action on the TV and something else: it allows you to control the whammy bar by sweeping your fingers across the screen. 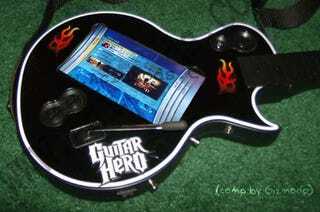 The mod took "about 3 days to make, and it wasn't really expensive: $108 for Guitar Hero III, $77 for the LCD, $44 for the touch panel and about $30 for miscellaneous items."